A couple of professional sports stars are making the news because of their talent and faith. Steph Curry, fresh off another NBA championship with the Golden State Warriors, is prepping his production company, Unanimous, to create several faith-based family-friendly films. “It’s not about me hitting people over the head with a Bible and telling them they have to believe a certain thing, or think a certain way,” Curry told Variety. Another film in the making, Church Hoppers, will be a comedy where a group of guys help their friend navigate the dating scene at a series of churches. Variety reports there will also be projects with sports and family themes. Curry formed Unanimous Media with Jeron Smith, a former Nike brand manager and White House deputy director of digital strategy during the Obama administration, along with producer Erick Peyton. He’s taking the movie making venture seriously. In fact, he told Variety this will be the first time he won’t play any basketball for a three-week period, instead focusing on his films. Curry has always used his platform to point people to Jesus. One of his favorite Bible verses is Philippians 4:13: “I can do all things through Christ who strengthens me.” In fact, it’s on his basketball shoes. 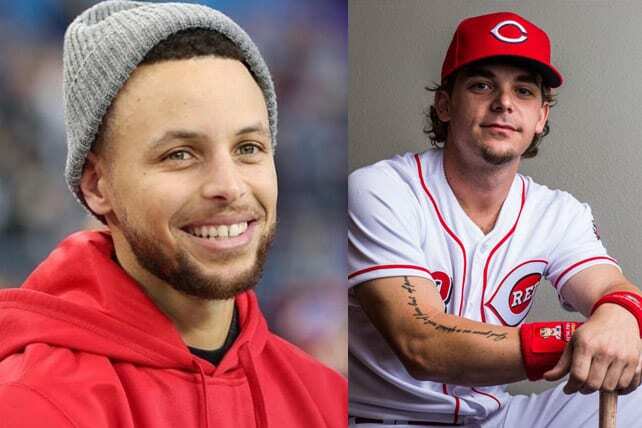 Meanwhile, Major League Baseball’s 83rd All-Star game Tuesday night will include Cincinnati Reds second baseman Scooter Gennett. Gennett told Latino Sports that the Lord is vital to his life. The Reds’ All-Star second baseman says that prayer and communicating with God have helped him through many of the trials he’s faced in his life. Listed on Gennett’s social media accounts is the Bible verse 1 John 4:20. When Gennett was with the Milwaukee Brewers he partnered with Open Arms home for Children in South Africa, which was started by Brewers broadcaster Davey Nelson. The charity provides a residential home for orphaned, abandoned or disadvantaged children and a few adults in the Eastern Cape of South Africa. They receive emotional, physical, spiritual and developmental support.